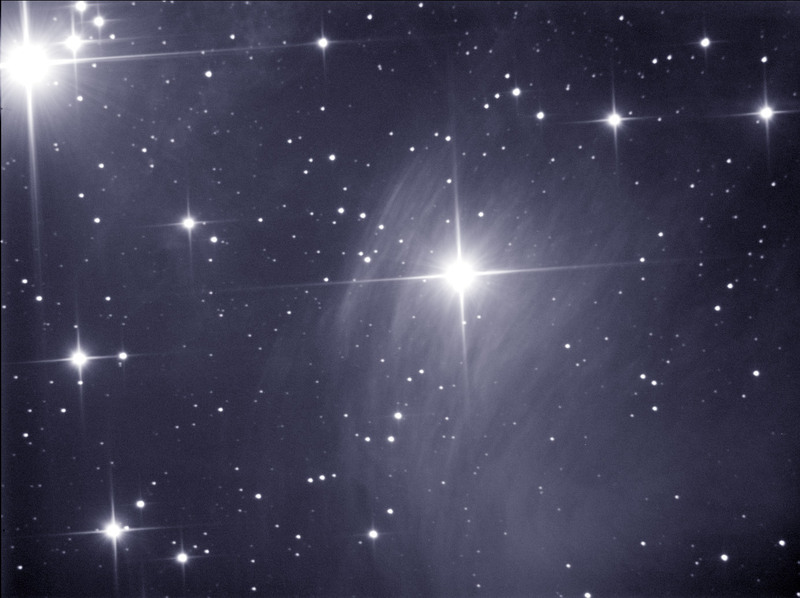 The is part of the complex reflection nebula around the star Merope in M45 Pleiades. Last year I imaged a smaller part of this area with my SC3 camera. This image is here. I am still getting to grips with is new Artemis CCD camera. Since my last images I have improved the collimation on the scope, so the stars across the field are a little better, although not yet perfect. They are roughly 4 arc seconds FWHM. The image above has been reduced to give a more pleasing view. The full sized image can be found here. A very cold night. About -6C. I need to work on sealing the cold chamber of the camera because I was getting ice crystals forming on the chip which means I had to turn off the peltier cooling. This means I had a few hot pixels to remove by hand. I used a variety of exposure lengths. I started at 200 seconds, and then finished up with a couple of 10 minute exposures. Somewhat on the limit of my autoguiding - a got two good 10 minute frames and 2 bad 10 minute frames. Although it is encouraging that flexure is low enough to guide that long. I was guiding with my SC1 black and white toucam on a 400mm refractor. As imaging was done at 1000mm this is a good demonstration of how you can do reasonable autoguiding with much less image scale / focal length than the imaging system. I have still not found my missing red filter, so this is a black and white image. I used photoshop to add a small amount of blue to the midtones - this makes the image slightly more pleasing in my opinion. Captured in Artemis Capture. Stacked in registax. Curves in photoshop. Artificial blue added in photoshop.